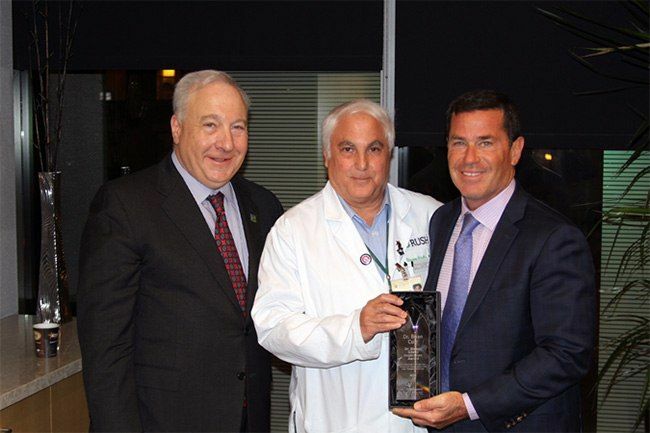 AlloSource, one of the nation’s largest providers of cartilage, cellular, bone, skin and soft-tissue allografts for use in surgical procedures and wound care to advance patient healing, announced the creation of the Dr. Steven Gitelis Inspiration Award. The award honors a doctor or clinician who inspires AlloSource through his or her work in treating patients with donated human allografts. Brian Cole, MD, MBA, of Midwest Orthopaedics at Rush is the inaugural 2017 recipient. Cole is an associate chairman and professor, Department of Orthopedics; chairman, Department of Surgery, Rush Oak Park Hospital; and Shoulder, Elbow and Knee Surgery, Section Head, Cartilage Restoration Center at Rush. The award’s namesake, Steven Gitelis, MD, is one of the founding physicians of AlloSource, recognizing the need for donated human tissue to heal patients through his work at Rush. Gitelis is a professor and vice chairman, Department of Orthopedic Surgery; director, Section of Orthopedic Oncology; associate chief medical officer for surgery; chief of surgery at Rush; and associate dean of surgical services at Rush Medical College. Read more here.